The Thermo Scientific Multidrop Combi Liquid Dispenser provides compact, flexible dispensing, with a wide volume range and broad selection of compatible vessels. This reagent dispenser can be used with any plate or well size all the up to 1536 wells, and plate heights up to 50 mm high. The Multidrop Combi automatically compensates for dispensing height, for fast dispensing and adaptable use in assay development, primary and secondary screenings, compound storage and much more. This plate dispenser operates with fully autoclavable dispensing cassetts, with 8 channels and a volume range from 0.5 to 2500 µl, with low volume dispensing capability, minimal back flushing and dead volume. 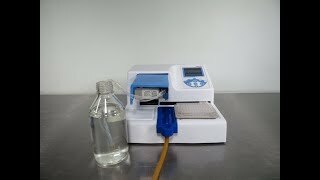 The Thermo Scientific Multidrop Combi reagent dispenser is robot compatible for a fully automated and high throughput solutions. Users can control this liquid dispenser from the upfront control panel, with icon based graphic display. The flexible FILL it software provides the means of selecting from the extensive list of plate options, as well as the ability to design and transfer protocols into the instrument. 384-well plate: 1µL in 5 sec. ; 5µL in 5 sec. ; 10µL in 6 sec. ; 20µL in 9 sec. 1536-well plate: 1µL in 14 sec. ; 5µL in 26 sec. Please note: Tube Cassette seen in photos is not included. This is our test cassette. Instrument came to us brand new and we purchased the cassette in order to test for a clean bill of health. This Thermo Multidrop Combi has been fully inspected and is operating without issue. All of our lab equipment comes backed with our standard warranty. Please note: Tube Cassette seen in photos is not included. This is our test cassette. Instrument came to us brand new and we purchased the cassette in order to test for a clean bill of health. Should you have any questions, please don't hesitate to contact us.